The best team in the American League has been outscored on the season? As I write this, the Texas Rangers own the No. 1 record in the American League at 74-53, second in all of baseball behind the Chicago Cubs (81-45). The Rangers have scored 588 runs this year. They've given up 589. Texas' run differential is -1, meaning they likely should be a .500 team. Run differential isn't a perfect stat, but it's usually a good indicator of success (which is why I'm confident the Red Sox are better than the Orioles). 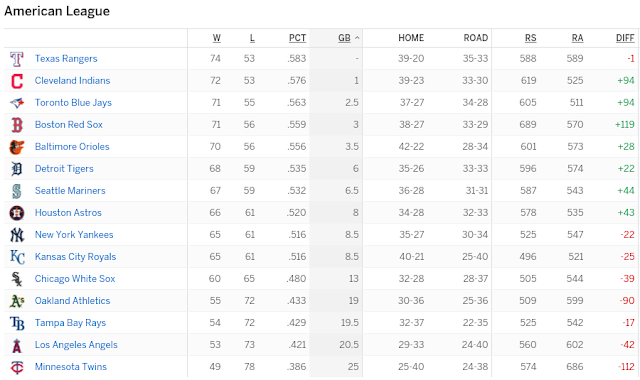 For example, in the National League the standings for all three divisions wouldn't even change if the teams were ranked by scoring differential instead of wins and losses. Look at the placement of the red and green numbers in the combined AL standings pictured above--there's one clear anomaly. 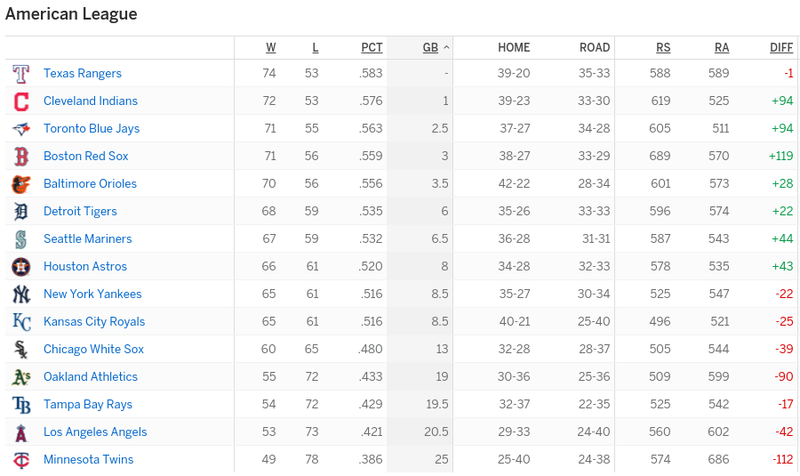 Don't be surprised if the Rangers fade down the stretch, it's weird for them to be where they are in the first place.